What to get the couple who have everything? It’s that age-old gifting nightmare. What to get that perfect couple who seem to have everything! These archetypal trendos are usually to be found elegantly lounging around in their beautifully decorated home, surrounded by an eclectic mix of art, furniture and technology – a perfect balance of timeless vintage and modern style, and all arranged with infuriatingly effortless skill. I am, demonstrably, not in one of these couples. So buying gifts for the friends of mine who do fall in this bracket is a perfect nightmare. Happily, arranging a group gift for this purpose is ideal. However you’ve still got that dratted issue of just what to get them. We recently came across a brilliant new site called ruby+diva – the self styled the ‘chic, unique boutique’. Originally designed for weddings, ruby+diva has been busy building up one of the best, most stylish and original gift lists we’ve come across (and we’ve looked at a lot as you can imagine). The Ruby+Diva gift list doesn’t inundate you with items, but rather is beautifully curated and well ranged in price. Their items include gifts ranging from Banksy screenprints (£6,000) and stunning handmade backgammon boards (£2,100) to stylish modern furniture (£80 – £250), trendy trinket boxes (£65) and hand thrown china (£20). And you can now create a Gift Page for any of ruby+diva’s items at the click of a button. Their team have included the Shareagift widget on their site so their customers can click the “Start Group Gift” button and automatically create a Gift Page on Shareagift.com to collect the funds with friends and share the cost. 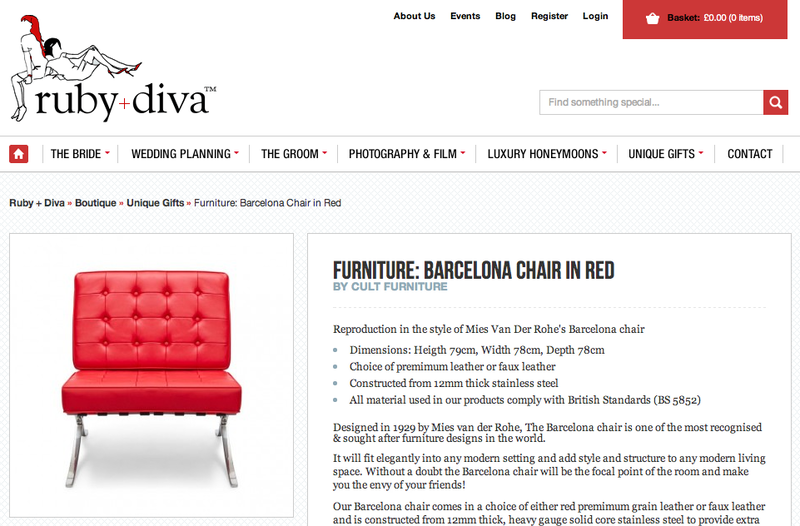 So for that couple who do have everything, it’s worth taking a quick look at ruby+diva. Whether it’s for a wedding gift, a house-warming, a thank you or other celebration gift – they’ve got some lovely things and the range is growing day by day. If you’re a supplier yourself, or a craftsman of beautiful items they’re always on the lookout for exceptional items to add so do get in touch. Equally if you’re a retailer and you’re interested to add the Group Gift button to your own site let us know – we’d love to hear from you.